Mustard is one of the most popular spices in German, Jewish and Russian cuisines. Russian mustard is notable for being particularly hot. In most European countries less hot (sometimes almost sweet) mustard, with large quantity of additives, is preferred. Mustard increases appetite, gastric juice secretion, which results in a considerably better digestion, and it is worth eating during cold. It will be also useful for those wanting to lose weight: it contains substances which split fats. Mustard should be excluded from the diet of people with gastric or duodenal ulcer. 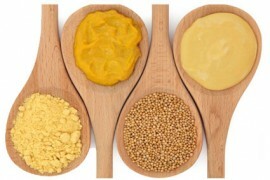 Mustard is a good emulsifier which serves as protective coating while cooking poultry, veal and even fish. It doesn’t only prevent meat juice dripping but also aromatizes the meat. Mustard (mustard powder) is used as spice primarily in meat dishes, as well as an ingredient of mayonnaise. There is also a great number of marinade recipes involving both whole mustard seeds and mustard powder. Homogeneously dyed micronized powder. It should be protected from moist, direct sunlight and heat sources. It should be stored in clean dry closed premises. It is used as an ingredient of mayonnaise, marinades, as well as a spice for meat dishes.